Presonus Eris E8 - 2-way active studio monitors give you the kind of clear and accurate sound that you probably wouldn't expect out of such budget-friendly speakers. For starters, these monitors feature robust 8" Kevlar woofers that offer excellent low-frequency reproduction with next to no distortion, and silk-dome tweeters that deliver smooth and balanced highs. The result: sound you can trust, which means the mixes you create will translate better from one stereo to another. What's more, PreSonus Eris E8s offer you extremely flexible back-panel controls that let you easily integrate your studio monitors with all the rest of your gear. If you've read the Sweetwater Studio Monitor Buying Guide, then you already know about the problems that go with putting your monitors too close to walls. That's when extreme low frequencies actually cause your walls to vibrate and act like big speaker cones, filling the air with false harmonics and ruining your ability to mix with accuracy. But sometimes, the shape and size of your room leaves you with no alternative but to place your monitors close to a wall. That's where the Eris E8's Acoustic Tuning controls come in handy. By cutting your Eris E8's bass by up to 4dB, you can compensate for this phenomenon, without neutering your sound. 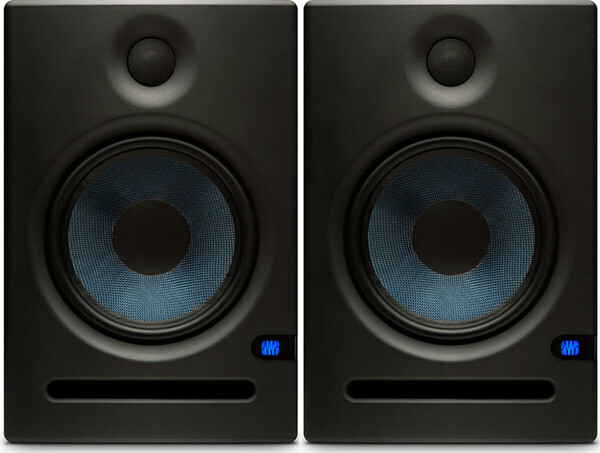 PreSonus Eris E8 studio-monitors offer pro studio performance for a home studio price!